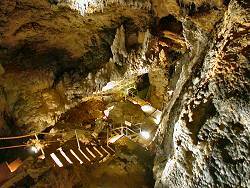 Image: a romantic path with rocks and caves leads to Sopie's Cave. Open: APR to OCT Tue-Fri 10:30-17, Sat, Sun 11-17, tours every half hour. NOV to MAR Sat, Sun 11-17, tours every half hour. Autumn school holidays daily 11-17, tours every half hour. 25-DEC to 09-JAN daily 11-17, tours every half hour. Fee: Adults EUR 3.50, Children (5-14) EUR 2.50. Groups (20+): Adults EUR 3, Children (5-14) EUR 2. Classification: Karst cave, dolomitic limestone, cave system, Malm (Jura). Dimension: L=900m, A=405m asl. Sophie's Cave: L=112m. BR: L=42m, W=25m, H=12m. T=8°C. Guided tours: L=220m, D=30min, V=28,000/a . Address: Burg Rabenstein Event GmbH, 95491 Ahorntal, Tel: +49-9202-97058-0, Fax: +49-9202-97058-1. Image: the cave entrance is called Ahornloch, and is rather impressive. 1490 first metioned. An attempt to extract Salpeter from the phosphatic cave sediments of the entrance hall (Ahornloch). 1788 discovery of the so called Klaussteinhöhle (Klausstein Cave). 18-FEB-1833 discovery of the Sophienhöhle (Sophie's Cave) during some works by the gardener Michael Koch. 1834 developed and opened as a show cave. 1837 probably excavations for prehistoric remains by Christian Hösch. 2000 closed for the public. DEC-2001 premises bought by the Dess und Haas Grundstücksverwaltungsgesellschaft, Nürnberg. 2002 reopened with new management. 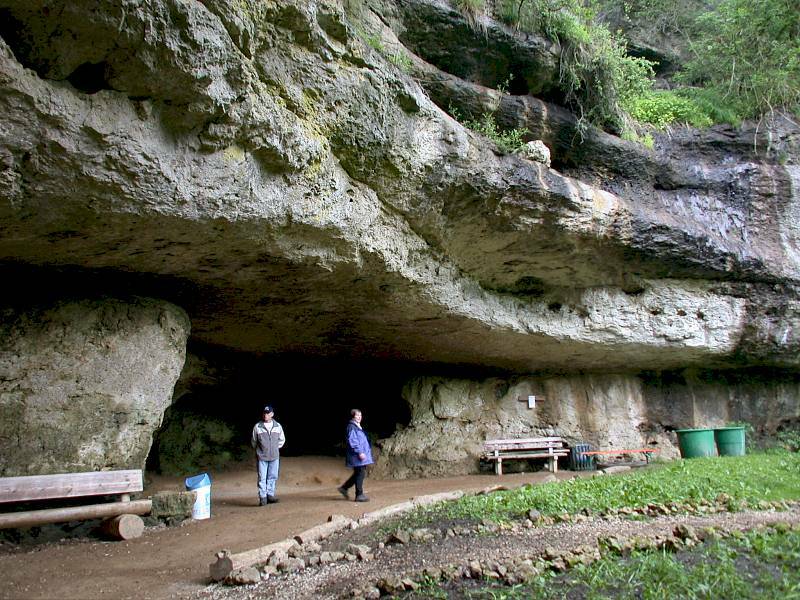 Image: this huge cavern was once filled with cave bear bones and archaeological remains. The sediments were mined to produce fertilizer. 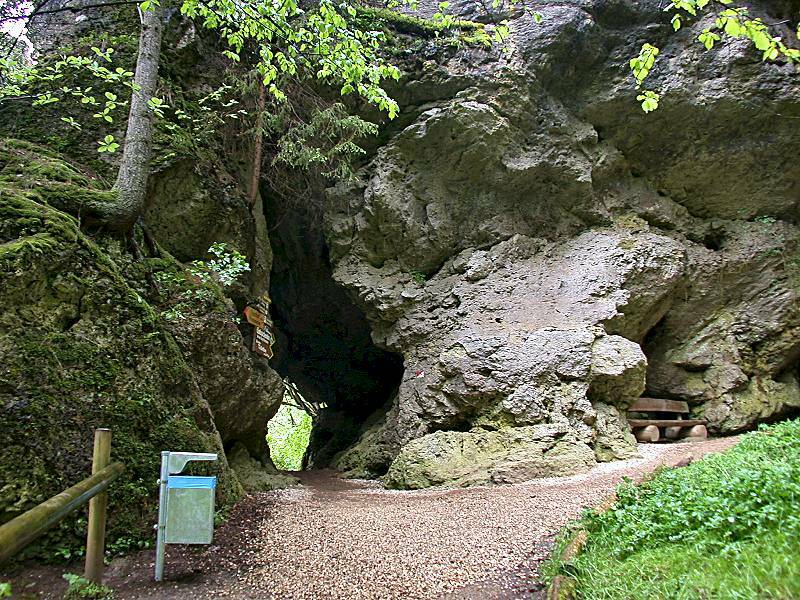 The Sophienhöhle (Sophie's Cave) is located at the NW slope of the Ailsbachtal (Ailsbach valley), near Burg Rabenstein. It can be reached in 15 mins walk from the parking lot near Burg Rabenstein or by an ascend of 35 meters from the parking lot at the bottom of the valley. Both walks a signposted. Image: the descend into the first chamber. The entrance to Sophie's Cave is a huge hall which was known for a very long time. 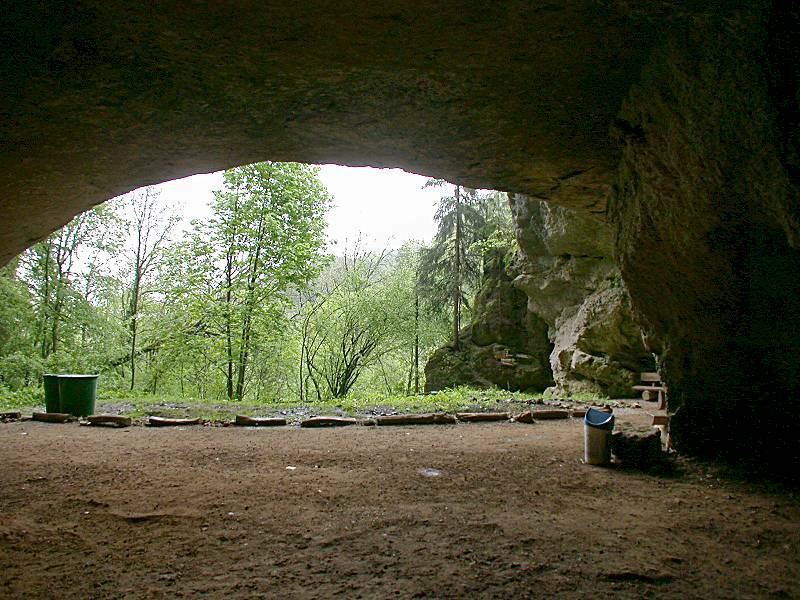 This shelter was used in late Stone Age and in Bronze Age. Before, it was used by cave bears for a very long time. The character of the cave is typical for caves in the area with its Dolomite rocks. Huge halls are connected by small irregular passages. The first two halls were accessible four thousands of years and were slowly filled with the remains of men and animals. This several meters thick layers contained cave bear bones, bat dung, human remains from the stone age and bronze age, dripstones and of course dolomite pieces from the portal above, loosened by weathering, especially by frost. Those layers filled the narrow passages between the chambers and so they were forgotten for thousands of years. 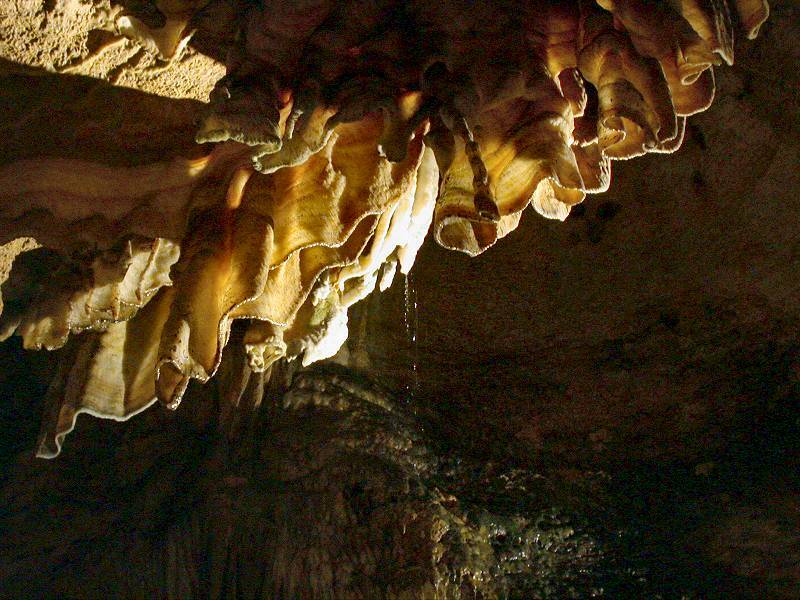 The cave was first mentioned in 1490, when a man named Hans Breu from Bamberg made a request to mine the phosphatic sediments in the cave. He tried to make salpeter for gun powder. Image: the millionaire with blue light, a "cool" idea of the current owner. At this time the huge portal was called Ahornloch. 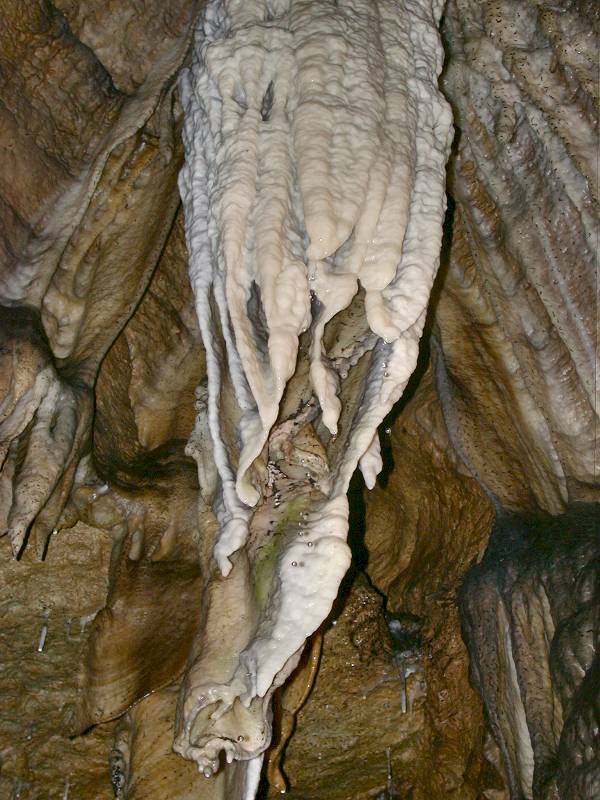 Ahorn is the German word for maple tree, but the cave was not named after this tree. It was named after the aristocratic family von und zu Ahorn, the noblemen of the valley. They lived above the cave on the plateau. 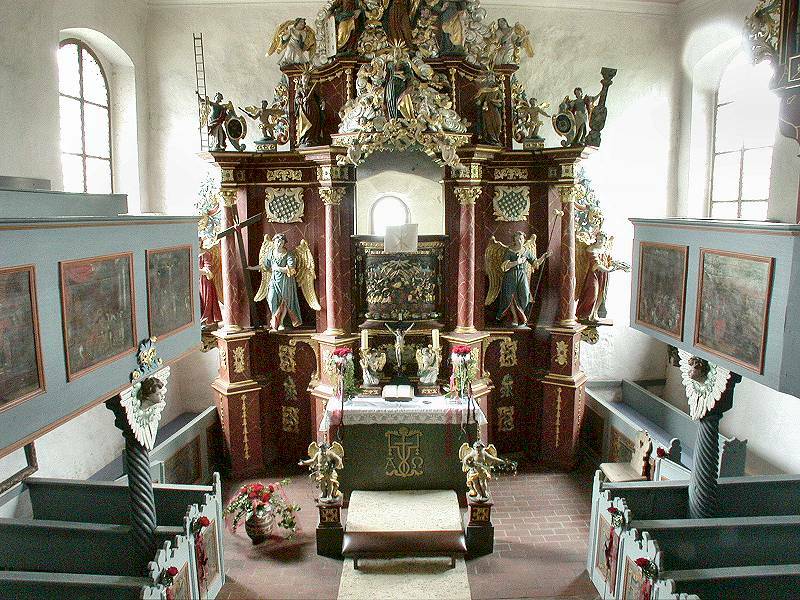 Today there is a chapel called Klaussteinkapelle, right above the cave, which once was the castle of this family. When this first castle became too small, they built Burg Rabenstein nearby. But a mircacle happend in the old castle, so it was not disassembled. They made it a chapel which was named Klaussteinkapelle, after their patron Hl. Nikolaus (Santa Claus). 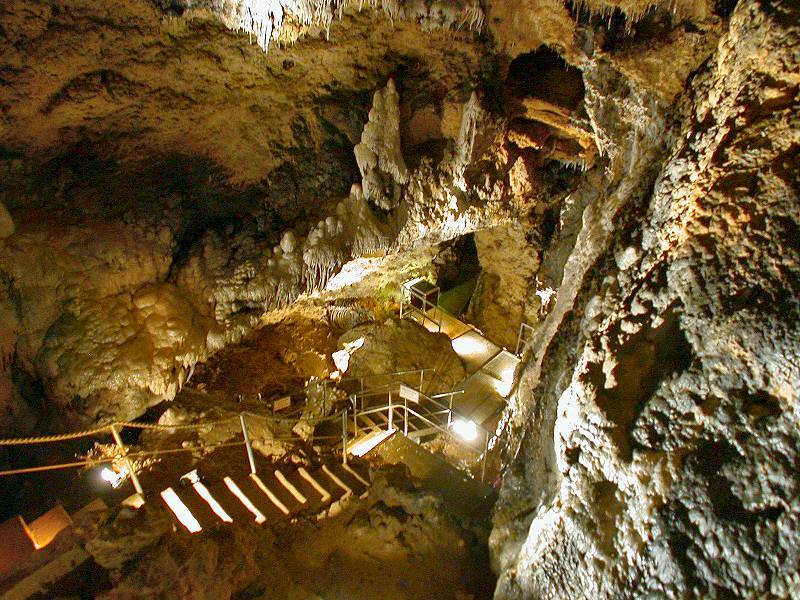 In 1788 during some digging in the Ahornloch, a passage was opened and a hall behind rediscovered, which was called Klaussteinhöhle. After this discovery, a treasure hunt took place, but during those digs the archaeological finds were ignored. 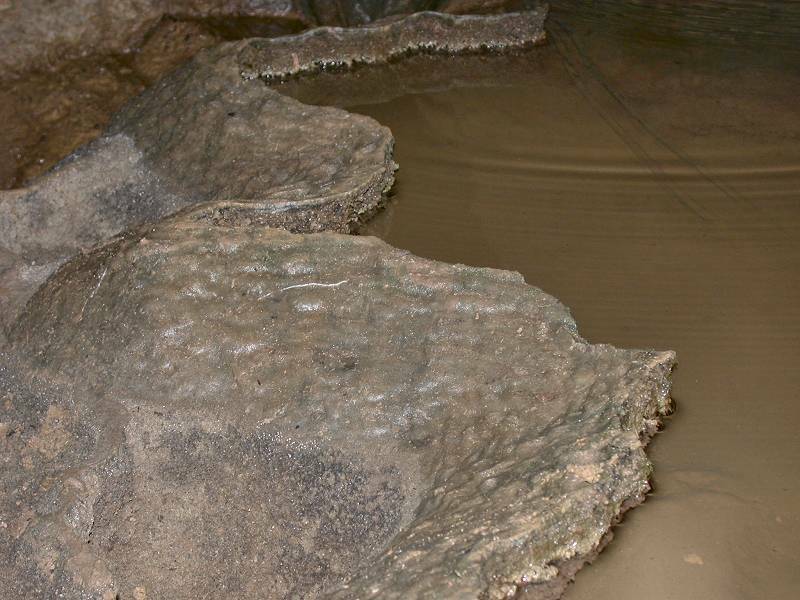 The whole material was thrown into a pit of the Klaussteinhöhle, thus filling this shaft completely. It divided the cave into two parts, the other part is today called Höschhöhle. Half a century late, the new owner of Burg Rabenstein and the cave, Graf Erwein von Schönborn zu Wiesendheit, told his gardener Michael Koch to do some beautification work. 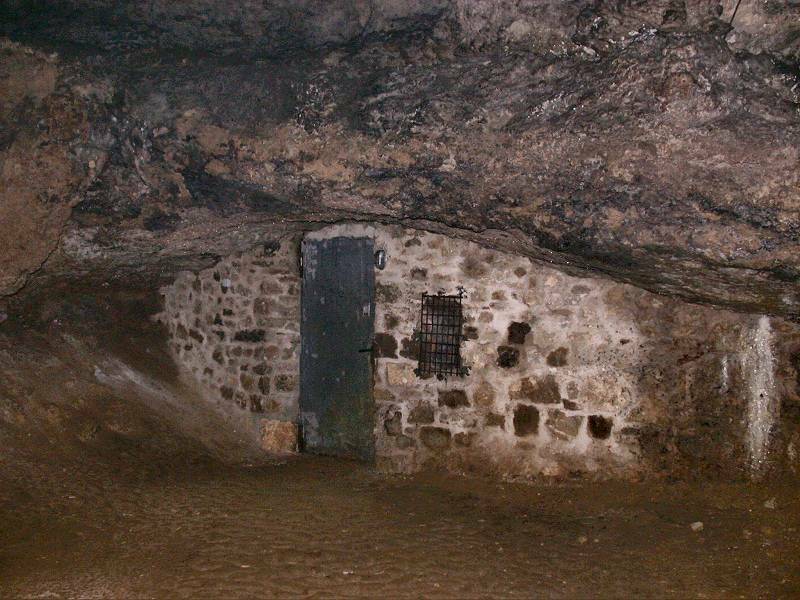 Why he was digging with his aide in the Klausstein Cave, is not clear. But during his work he felt a cold air current, and had the right idea as he guessed a cave. The chambers he discovered were called Sophienhöhle (Sophie's Cave) in honor of the niece of the owner, Countess Sophie von Schönborn. The owner closed the cave immediately, to prevent it from being destroyed. He knew the stories about the discovery of the Klausstein Cave and the destructions. But he advised his men to develop the cave with paths a steps. He showed the cave to his guests, which was the start of the show cave, although it was not really open to the public. This four caves are called Klaussteinhöhlen-Komplex (Klausstein Cave System) or - a little bit easier but not correct - just Sophie's Cave. 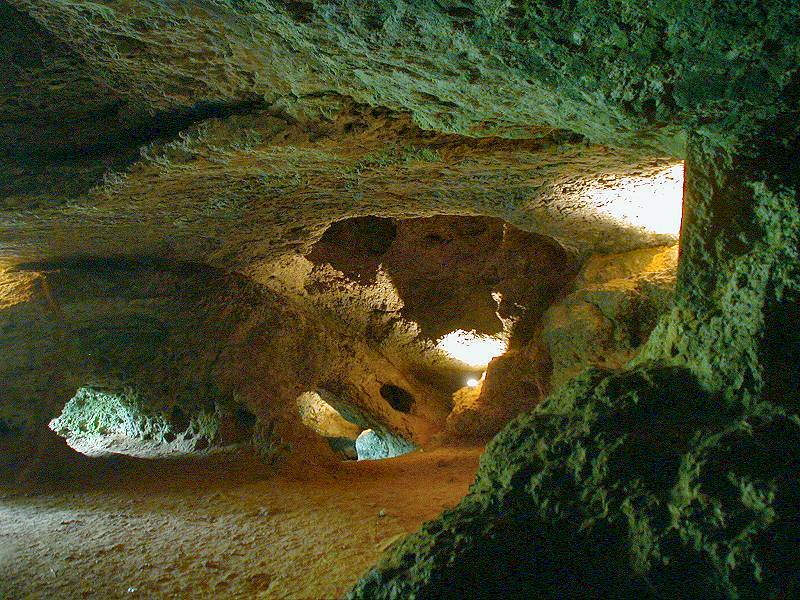 Ahornloch and Klaussteinhöhle are open and may be visited all the time. 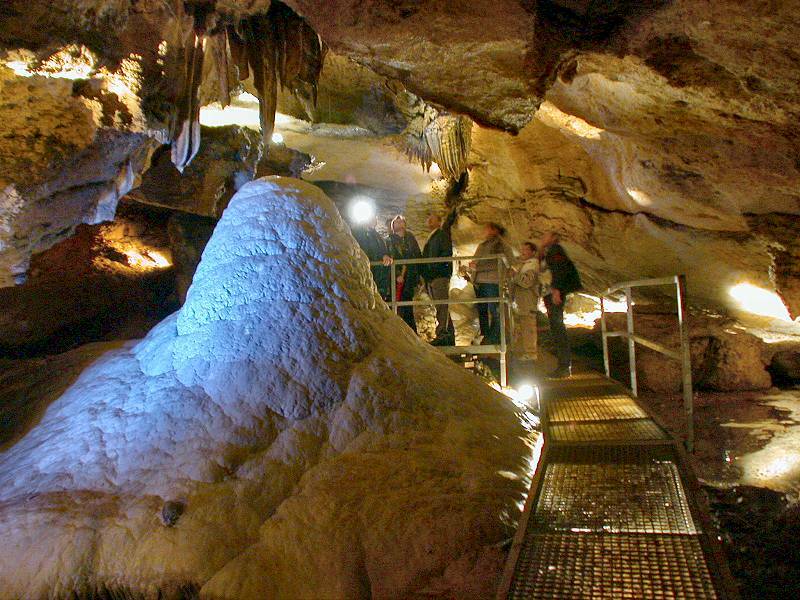 Sophies cave is closed and must be visited during a regular tour. The Hösch Cave is not accessible at all. The whole area, including cave and castle, was sold several times in the last years. Obviously cave, grounds and Burg Rabenstein are, despite their various sights and long history, not really a good investment. After being closed for two years because of an owner change, the cave now has a new owner. The new owners are very active and already made several improvements to the cave. The paths and the lightning were partly renovated. Sophienhöhle at night is a new offer which is unique for Germany. 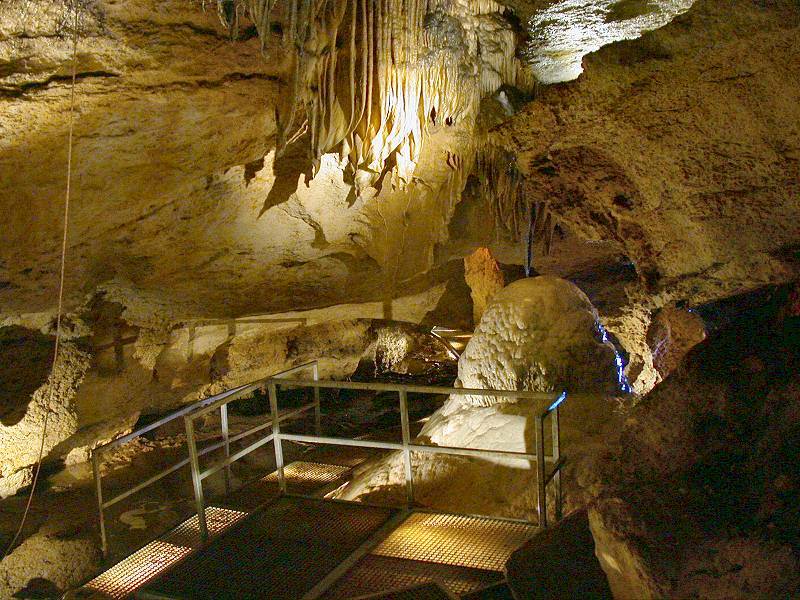 The open hours were extended for three hours, and the cave is open for self guided visits. The visitors may explore the cave and take pictures as they like. In the entrance hall, the Ahronloch, nature documentaries are shown, and in front of the cave an inviting campfire burns.